Fathers of American Mycology. (Left to right): Lewis David de Schweinitz, Job Bicknell Ellis and Charles Horten Peck. History: The State of New Jersey has served as one of the cradles of American mycology. 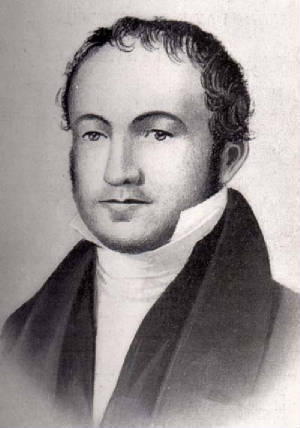 Such notable early American mycologists as Lewis David de Schweinitz (1780-1834), Job Bicknell Ellis (1829-1905) and Charles Horten Peck (1833-1917), all made extensive collections in the State. 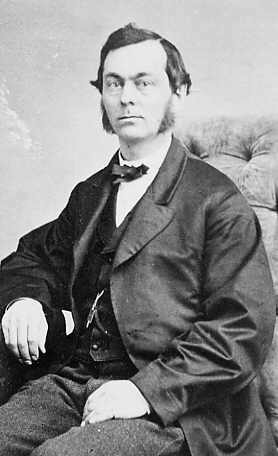 Most closely associated with the State of New Jersey was the mycologist and Civil War veteran Job Bicknell Ellis. Ellis was born in Potsdam, St. Lawrence Co., New York, January 21, 1829, and graduated from Union College in Schenectady, New York, in 1849. He is best known for his extensive collections and expertise in the taxonomy of the pyrenomycete fungi collected from New Jersey. 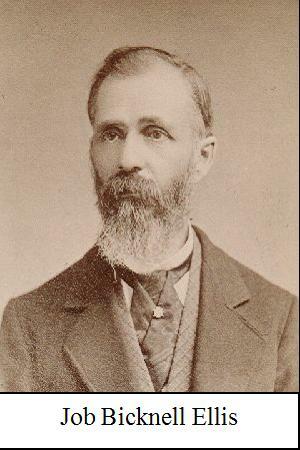 Although he had no formal training as a botanist or mycologist, Ellis, together with his wife Arvilla J. Bacon, dedicated their lives to the collection, exchange and sale of duplicate sets of dried fungal specimens (exsiccati). The most important of these are Fungi Nova-Caesareenses (Fungi of New Jersey, 1878) and the North American Fungi, issued in series from 1878 to 1898. Based in Newfield, New Jersey, Ellis maintained a voluminous correspondence with American and European mycologists throughout the later half of the 19th century. Together with Benjamin Matlock Everhart, a wealthy merchant of Westchester, Pennsylvania, they co-authored and published North American Pyrenomycetes (1892), an authoritative account of pyrenomycetes from the North Eastern United States. Along with William A. Kellerman, Ellis and Everhart founded the Journal of Mycology (1895), a forerunner to Mycologia. Toward the end of his life (1896), Ellis sold his collection of over 100,000 specimens to The New York Botanical Garden. 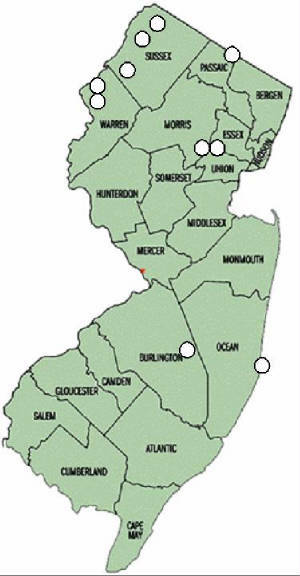 Map fo New Jersey with the sites collected labled. Ecology: New Jersey has over a half million acres of state-owned forest land under the jurisdiction of the Forestry Service, State Parks, and various Fish, Game and Wildlife organizations. In addition to these lands, county and local public forests, plus privately owned forests and woodlands, brings the total amount of forested land to roughly two million acres. However, most of this forested land is in the earliest stages of recovery from the impact of several centuries of intensive deforestation. Tree harvesting, especially during the industrial revolution, included wood for construction lumber, heating fuel, steam engine fuel, road development, and the smelting, leather tanning and charcoal industries in particular. Forest clearing for farm and grazing land further contributed to the destruction of the forests of New Jersey. As a consequence, almost all of New Jersey’s forests have been logged many times over, leaving an ecosystem in varying states of recovery. At the beginning of the last century, pressure on New Jersey’s forests lessened to some extent. Coal and later oil and gas, largely replaced wood for residential, commercial and industrial power use. Railroads and subsequently trucks on extensive highway systems greatly expanded the practical distances over which timber could be brought to eastern markets, lessening the immediate impact of logging on the forests of New Jersey. During the last century, tree cover has returned to substantial parts of New Jersey. However, as a consequence of centuries of intensive development, there is almost no old growth left in New Jersey and mature stands of oaks, tulip trees, elm, sassafras, chestnut, sycamore, sweet gum, maple and hickory are few and far between. This being said, there are a number of unique vegetative zones that could support a healthy mycological flora and undisturbed habitats in these areas were sought out for this project. The primary focus was the Kittatinny Ridge habitat complex in New Jersey. The Shawangunk – Kittatinny Ridge is the northernmost ridge in the Appalachian Ridge and Valley physiographic province. The ridge begins in southern New York State, southeast of the Catskills, as the Shawangunk Ridge, and continues through New Jersey south into Pennsylvania and the southern Appalachians where it becomes the Blue Ridge. The ridge is primarily composed of hard quartzite conglomerate and sandstone caprock overlying shale. The middle and western parts of the Kittatinny Ridge are sandstone and shale, with increasing amounts of limestone on the western slopes along the Delaware River. The ridge reaches its maximum elevation in New Jersey at High Point State Park at 550 meters (1,803 feet). There is an unusual diversity of plant communities on the ridge and associated flanks, comprised of species typically found north of this region, alongside communities typically found south or restricted specifically to the coastal plain. This results in habitat complexes containing many species at or near the limits of their range. For example, the tulip tree, sassafras, southern red oak, blackjack, post and basket oaks, sweet gum, red mulberry, common persimmon, sweetbay magnolia and eastern sycamore are at their northernmost range in New Jersey. Conversely, tamarack, red pine, black spruce, common juniper, gray and yellow birch, speckled alder, fire and choke cherry, quaking aspen and northern hackberry are at their southernmost range in New Jersey. These range limits for the listed species in New Jersey were hoped to provide for a diverse assemblage of hosts for a diverse mycological flora. Although the majority of hosts sampled were mid-range residents, an effort was also made to seek out plant host substrates at the limits of their ranges. Botany: Unique plant habitats in New Jersey include for example chestnut oak and mixed-oak forests, pine barrens, including dwarf pine ridges in the Shawangunks (New York), hemlock northern forests and cliff and talus slope communities. Wetlands include numerous small lakes and streams, bogs, pitch pine-blueberry peat swamps, inland Atlantic White cedar swamp (High Point), red maple swamps, acidic seeps, calcareous seeps and a few emergent marshes. The most ubiquitous forest community on the Kittatinny Ridge is comprised of the chestnut oak Quercus montana (= Q. prinus), northern red oak (Q. rubra), white oak (Q. alba), eastern black oak (Q. velutina), and sweet birch (Betula lenta), with an understory of Ericaceous bushes and saplings of red maple (Acer rubrum), black birch (Betula nigra), witch hazel (Hamamelis virginiana) and American chestnut (Castenea dentata). On more mesic sites, additional species include white ash (Fraxinus americana), sassafras (Sassafras albidum), ironwood (Carpinus caroliniana), eastern sycamore (Platanus occidentalis), pignut hickory (Carya glabra), shagbark hickory (C. ovata), yellow birch (Betula alleghaniensis), gray birch (B. populifolia), black cherry (Prunus serotina) and American beech (Fagus grandifolia). North facing slopes, such as along the VanCampens Trail north of Worthington State Forest, include hemlock forests dominated by eastern hemlock (Tsuga canadensis), red and chestnut oaks, sugar maple (A. saccharum), American beech, and the tulip tree (Liriodendron tulipifera). In some instances, such as along the Rattlesnake Swap Trail north of Catfish Pond and along the Dunnfield Creek Trail, the great rhododendron (Rhododendron maximum) can form dense thickets. On the dry ridgetops of the Kittatinny can be found pitch pine (Pinus rigida), chestnut oak, scrub oak (Q. ilicifolia), common juniper (Juniperus communis), lowush blueberry (Vaccinium angustifolium), sweet fern (Comptonia peregrina), black huckleberry (Gaylussacia baccata), and serviceberry (Amelanchier canadensis). Red maple swamps occur in several areas along the Kittatinny ridge and are dominated by red maple, black gum (Nyssa sylvatica), white ash, yellow birch, speckled alder (Alnus incana), spicebush (Lindera benzoin), sweet pepperbush (Clethra alnifolia) and a herbaceous layer of skunk cabbage (Symplocarpus foetidus), cinnamon fern (Osmunda cinnamomea), sensitive fern (Onoclea sensibilis), groundpine (Lycopodium obscurum) and Sphagnum spp. Since most of the State’s ecosystems have experienced severe disturbance and are in the earliest stages of recovery, this presented a challenge for collecting in undisturbed sites. An effort was made to secure promising collecting areas based on a visual gauge of ecosystem maturity and forest age. Tree girth dictated where to collect and disturbed areas were avoided as much as possible. The following areas were visited regularly for collecting in the Delaware Water Gap National Recreation Area, Warren Co. and Sussex Co.: Worthington State Forest (Karamack, Beulahland, Douglas and Dunnfield Creek Trails), north of Worthington State Forest on the Copper Mines Trail, Rattlesnake Swamp Trail, VanCampens Glen Trail, Appalachian Trail (Catfish Lookout Tower section), Depew Recreation Site, and along deer trails near the Blue Mountain Lakes Road and Skyline Drive areas. Further north, in Stokes State Forest, the Stony Brook, Cartwright and Howell Trails near Sunrise Mtn. served as base trails from which less disturbed habitat was sought and were regularly visited throughput the year. In the northern center of the state, the Great Swamp National Wildlife Refuge in Morris Co. and the Watchung Reservation in Union Co. were also included as regular collecting sites, as was occasionally Ringwood State Park further north in Passaic Co. One collection originated from the Island State Beach in Ocean Co.
Introduction to Mycology: The fungi constitute a broad group of heterotrophic, absorptive organisms, devoid of chloroplasts, that typically have a diffuse, branched, tubular thallus comprised of interwoven hyphae, eventually producing some type of meiospore and/or mitospore as a means of reproduction and dispersal. Historically, the study of these organisms has bridged the botanical and microbiological sciences, although their nearest relatives are understood today to be protozoans and animals. The Kingdom Fungi is presently understood to comprise the Ascomycota, Basidiomycota and the Archemycota, the latter being heterogenous in composition and phylogeny. The present study is concerned primarily with the Ascomycota, specifically members of the Hymenoascomycetes and the Loculoascomycetes (asterisks) recovered from wood in New Jersey. Fungal Ecology: It has recently been estimated that some 1.5 x 106 species of fungi are thought to exist, with about 80,000 species or only 5% having yet having been described, making the fungi one of the most speciose groups of organisms on the planet. Fungi occupy every conceivable niche imaginable. Common substrates include soil, rock, fresh and marine waters, all manner of plant parts, exudates, other fungi, lichens, every animal group, dung and all man-made habitats, and can be found in abundance in every climatic region. The major lineages of fungi evolved prior to the continental breakup some 350 million years ago in the Carboniferous, meaning that the present biogeography in many cases remains pan-global. Thus, fungi listed from New Jersey are equally likely to be found fruiting along the same latitudinal gradients across Europe and Asia. Recent fossil and molecular evidence suggest that fungi were one of the first land colonizers and many scientists now believe that fungi played a decisive role in the initial colonization of the terrestrial habitat by land plants. Indeed, fungi are intimately associated with both aerial and subterranean plant organs, comprising such mutually beneficial associations as mycorrhizae in roots and endophytes in leaves, flowers and fruits. Fungi are most notable in the role they play in the decomposition or bio-recycling of plant and animal remains and in forest-turnover. Finally, many fungi are notorious for the diseases they cause in plants, animals and man, especially in regard to the difficulty with which they can be controlled by chemical ameliorants. Introduction to Taxonomy: The primary focus of this project was to collect lignicolous microfungi belonging to the Ascomycota. To appreciate the complexity of the group, a basic understanding of the character states that define their taxonomy and phylogeny is required. The Ascomycota differ from the Basidiomycota (mushrooms, bracket fungi, stinkhorns, coral fungi, and earth stars) in having the products of meiosis borne internally in a sac termed the ascus, rather than externally and born on the tips of sterigmata on structures termed basidia. Both asci and basidia are technically meiosprangia in which the products of meiosis, meiospores (i.e., ascospores and basidiospores), are formed. Although members of both groups can and in many cases routinely produce asexual mitospores, it is in the ascomycetes where the propensity to exist in a pleomorphic state is most pronounced. That is, the same individual can possess multiple morphologic states depending upon the interplay of environmental signals and genetic factors. Since the International Code of Botanical Nomenclature allows for only one Latin binomial to be given to each biological species, a historical peculiarity of mycology has existed in which two names were given to the same organism due to the lack of a known connection between the two. These two states, the asexual anamorph and the sexual telomorph, together comprising the holomorph, rarely co-exist in culture and more commonly are separated in both time and space. Proving the connections between genetically identical anamorphs and telomorphs has proved to be a major focus of modern mycology. Taxonomy of the Ascomycota: According to recent estimates, there are more than 40,000 described species of ascomycetes, belonging to 3,266 genera, grouped in 264 families in 46 orders, and comprise the largest group of fungi. Ascomycetes were originally subdivided based on the gross morphology of their fruitbodies, termed ascoma, and this is still the basis for understanding the groups at the introductory level. Thus, as a first approximation of what represents a natural phylogeny, ascomycetes are arranged in the following groups: the Archiascomycetes (e.g., Pneumocystidales), comprised of heterogenous forms with as yet unresolved basal phylogenies, the Sacharomycetes and allies, often referred to as the Hemiascomycetes, with no ascoma and naked asci (Saccharomycetales, Schizosaccharomycetales, Protomycetales & Taphrinales), the Plectomycetes (Ascosphaerales, Eurotiales & Onygenales) with closed ascoma termed cleistothecia, the Hymenoascomycetes, comprising both the Discomycetes, with open, cup-shaped ascoma termed apothecia, and the Pyrenomycetes with flask-shaped ascoma termed perithecia and, finally, the Loculoascomycetes, characterized by a range of ascoma types, with uni- or multi-loculate ascostromata or pseudothecia. Lichenized taxa can be found in both the Hymenoascomycetes and the Loculoascomycetes. Fungal Developmental Biology: In his 1951 treatise Taxonomy of the Pyrenomycetes, E.S. Luttrell emphasized the relationship between the ascus and the totality of ascocarp components (i.e., the centrum), stressing, as major character states, the type of ascus, the nature of its dehiscence, the origin of the ascocarp wall, whether false and derived of somatic tissue, which he termed ascostromatic, or true and developing as a result of a sexually committed hyphal system, and the nature of the ascocarp centrum. He proposed segregating the Saccharomycetales, Protomycetales, Taphrinales from the Euascomycetes and dividing the latter into two series, the Unitunicataeand the Bitunicatae, corresponding to the Ascohymeniales and the Ascoloculares first proposed by Nannfeldt in 1932. Since then, supraordinal classification of the two groups has been based primarily on the developmental biology of the ascoma, ascus dehiscence and the absence or presence and type of hamathecial tissues (sterile elements). This is because genes governing developmental pathways associated with sexual reproduction are believed to more accurately reflect true phylogenies. The activities of these conserved genetic pathways can be discerned directly from a microscopic analysis of the developmental morphology of ascoma and centrum development, character states that have served as the basis for modern ascomycete classification. The most important character state separating the Hymenoascomycetesfrom the Loculoascomycetes is the developmental biology of the ascoma: in the Hymenoascomycetes the ascoma originates following nuclear pairing in the dikaryon, whereas in the Loculoascomycetes the ascoma originates prior to nuclear pairing in the dikaryon. In conjunction with ascoma origin, the nature of ascus dehiscencefurther separates the two groups. In the plesiomorphic state, a prototunicate ascus has no opening mechanism and simply deliquesces to release ascospores (e.g., Hemiascomycetes & Plectomycetes). Conversely, the eutunicate ascus is either functionally unitunicate when it opens by a simple or elaborate pore or by a lid-like operculum (e.g., Hymenoascomycetes) or functionally bitunicate when the firm ectoascus ruptures and the elastic endoascus emerges and elongates in a jack-in-the-box fashion and is then termed fissitunicate or semi-fissitunicate (e.g., Loculoascomycetes). In both unitunicate and bitunicate orders, secondary reversals to the prototunicate state are known. The hamathecium may be lacking or composed of rows or strips of delicate cells that deliquesce at maturity or are pushed aside by developing asci; this reduction or loss of the hamathecium is considered the apomorphic state. If present, the hamathecium may develop from the subhymenium to produce apically free paraphyses or paraphysoids interspersed among the asci. Alternatively, the hamathecium may develop from the apical region downwards to produce pseudoparaphyses, paraphysoids or trabeculae, these usually becoming attached to the subhymenium, and then are often difficult to discern if earlier stages are not examined. In some cases these hamathecia may remain short and form a fringe above the asci and are then termed periphysoids. Ascomycota Classification based on M.E. Barr (1987): The present floristic survey is concerned primarily with the pyrenomycetous members of the Hymenoascomycetes and the Loculoascomycetes and follows the classification scheme set forth by M.E. Barr for the major orders. In the Hymenoascomycetes, members of the Plectoascomycetidae (Ascosphaerales, Eurotiales & Onygenales) are typified by cleistothecioid ascoma, exhibiting indeterminate growth, soft peridia and with asci not arranged in a true hymenium. Asci are typically irregularly scattered in the centrum, small, spherical, without a discharge mechanism and contain small one-celled ascospores (not considered in this study). Members of the Parenchymatomycetidae typically possess a pseudoparenchymatous centrum in which the tissues disintegrate as the asci mature. While in most cases the sterile elements deliquesce as the asci develop and are not present at maturity, in some cases paraphyses may develop into the cavity and persist until ascospores are mature. These elements are distinguished from true paraphyses and have been termed catenophyses. The largest orders are the Diaporthales, with immersed erumpent ascoma, hemibiotrophic or biotrophic, with dehiscent asci that at maturity float freely in the centrum, and the Sordariales, with superficial ascoma, mainly saprophytic and whose asci do not dehisce, but may deliquesce to release ascospores in the centrum. The Erysiphales bear superficial cleistothecia on obligately biotrophic haustorial hyphae and are temperate is distribution, but today are considered to be closer to inoperculate Discomycetes(Leotiales) than to the Pyrenomycetes. The Meliolales & Coryneliales are obligate biotrophs and tropical. The Halosphaeriales & Spathulosporales are marine saprobes or biotrophs, respectively. The Microascales typically have small perithecioid ascoma, often with a long narrow beak, or cleiostothecia, containing small deliquescent asci, usually insect associated, strongly cellulytic, and usually with small one-celled ascospores, often dextrinoid when young. The Anoteromycetidae comprise a single order, the Hypocreales, characterized by apical paraphyses (periphysoids) that develop down into the centrum, but are usually deliquescent upon maturity or may be visible as a residual fringe in the upper mature centrum. Ascoma and stromatic tissues are mostly brightly pigmented, fleshy to soft-textured, with asci forming a basal or peripheral layer, usually containing hyaline to lightly pigmented ascospores. In the Edaphomycetidae, the centrum tissues are prosychymatous at first with apically free, true paraphyses, either interspersed among the asci or peripherally arranged in the centrum. The largest order is the Xylariales, characterized by apically free paraphyses that are interspersed among large unituncate asci, often with a clearly amyloid apex, borne in large perithecia associated with a distinct stroma, enveloped in a peridium of compressed rows of cells. Members of the Clavicipitales possess long cylindric asci and ascospores, with a refractive apex perforated by a narrow canal, a centrum containing lateral paraphyses, multiple perithecia borne in brightly pigmented stromata and a biotrophic, usually entomophathogenic, habit. The Calosphaeriales are typically saprobic on wood, with few paraphyses, these often acuminate, subtending a cluster of fasciculate asci, containing allantoid ascospores often borne in long-necked perithecia. The Loculoascomycetes: As in the Hymenoascomycetes, supraordinal classification of the Loculoascomycetes is also based upon the developmental biology of the centrum and hamathecial characteristics. Members of the Loculoplectoascomycetidae are typified by indeterminate growth of the ascoma and the absence of a peridium, resulting in an irregular ascoma more akin to a thallus. The asci rise singly, are scattered or are interspersed with paraphysoids in the centrum. The Myriangiales are saprobic, epiphytic or biotrophic (e.g., with scale insects), lacking a hamathecium, with separate globose to subglobose asci overarched by pseudoparenchymatous cells, hymenial gel not bluing in iodine, whereas the Arthoniales are lichenized or epiphytic, with asci separated by vertically oriented cells serving above as paraphysoids with free tips forming a pseudoepithecium with a hymenial gel bluing in iodine. The Loculoparenchymatomycetidae are characterized by the absence of a hamathecium, in which the developing asci push up among disintegrating cells of the centrum. The Asterinales are superficial leaf biotrophs with coarse, dark mycelium, a thin peridium, composed often of a single row of cells, opening by a slit or deliquescent apical cells, and short oblong asci. The Capnodiales or sooty molds are superficial leaf epiphytes, often associated with insect or plant exudates, with globose ascoma borne in a dematiaceous subiculum, apex with a small lysigenous pore, centrum without periphyses and hamathecium absent. The largest order is the Dothideales, usually with immersed-erumpent, rarely superficial, ascoma, without a hamathecium, but sometimes with interthecial tissues remaining among or above the asci. The remaining members of the Loculoascomycetes all have a distinct hamathecium. Members of the Loculoanoteromycetidae have distinct periphysoids and include the lichenized perithecioid Verrucariales and the nonlichenized Chaetothyriales, characterized by the formation of short saccate or clavate fasciculate or basal asci below short fringing periphysoids, often with the ascus bearing a schizogenous apical pore. The Loculoedaphomycetidae includes orders having paraphysoids or pseudoparaphyses. Members of the lichenized Opegraphales and nonlichenized Patellariales have an apothecioid ascoma and paraphysoids with free apical ends that are often thickened, branched and encrusted forming a pseudoepithecium above the asci. The centrum in members of the Pleosporales and the Melanommatales possess pseudoparaphyses borne in perithecioid ascoma. Cellular pseudoparaphyses, basal asci and ascospores showing bipolar asymmetry typify the Pleosporales, whereas narrowly trabeculate or sometimes unbranched pseudoparaphyses, asci usually peripherally arranged and ascospores mostly with bipolar symmetry typify the Melanommatales. What follows is a review of the ascomycetous fungi collected in this study, following the classification outline of the Hymenoascomycetes and Loculoascomycetes set forth above. The major orders, families and genera recovered from frondose and coniferous wood in New Jersey will be discussed and particular examples illustrated in the 44 color plates found at the end of the report. Given the time available, a good sampling of orders from both the Hymenoascomycetes and Loculoascomycetes orders was achieved (see below) resulting in fair representation of the mycological flora of the State of New Jersey. The Hymenoascomycetes: Clearly, a complete phylogenetic resolution of the Hymenoascomycetes based on principals of monophyly has yet to be achieved. Most striking is that current data point to a basal phylogeny for the Discomycetes (Pezizales, Helotiales, & Rhytismatales), subtending the Hymenoascomycetes and the Loculoascomycetes and including the Erysiphales. Another major development is the placement of the lichenized orders, Caliciales, Lecanorales & Ostropales as possibly transitional to the Loculoascomycetes. Arrows and question marks indicate possible polyphyetic orders and their affinities. The asterisks denote those oders sampled in this study. Hymenoascomycetes associated with wood in the State of New Jersey included members of the following orders and families: Xylariales [Xylariaceae], Amphisphaeriales [Amphisphaeriaceae], Diatrypales [Diatrypaceae], Calosphaeriales [Calosphaeriaceae], Diaporthales [Diaporthaceae and Valsaceae], Sordariales [Lasiosphaeriaceae and Nitschkiaceae], Hypocreales [Hypocreaceae], Clavicipitales [Clavicipitaceae], Helotiales [Geoglossaceae and Dermateaceae], Pezizales [Helvellaceae] Rhytismatales [Rhytismataceae], Erysiphales [Erysiphaceae], Phyllachorales [Phyllachoraceae] & Ostropales [Graphidaceae]. Xylariaceae (Xylariales): In this family stromatic tissues are well-developed, immersed, erumpent or superficial, ascospores brown, one cell or with small terminal cell, rarely one septate, typically with elongate germ slit. The centrum is of the Xylaria-type defined by asci peripheral or sometimes basal, apical ring rarely lacking, refractive, typically amyloid, true paraphyses usually numerous. Commonly encountered genera in the Xylariaceae included Hypoxylon, Xylaria, Daldinia, Lopadostoma, Creosphaeria, Whalleya & Rosellinia. Aside from ubiquitous members of the Xylariaceae, such as Daldinia concentrica (Bolton ex Fries) Cesati & de Notaris, Hypoxylon rubiginosum (Pers. ex Fr..) Fries, Hypoxylon fragiforme (Pers. Ex Fr.) Kickx., and Xylaria polymorpha (Persoon ex Merat) Greville, several other xylariaceous fungi proved to be remarkable. Of particular interest in our region are two unusual xylariaceous fungi associated with the sassafras tree, Sassafras albidum, namely the monotypic Creosphaeria sassafras (Schwein.:Fr.) Ju, San Martin & Rogers and Whalleya microplaca (Berk. & Curtis) Rogers. Although rarely reported in the literature, these two species, illustrated here as EB0179 and EB0162, respectively, proved to be ubiquitous wherever sassafras occurred in New Jersey. Both fungi have recently undergone taxonomic revisions. Rosellinia subiculata (Schw. : Fr.) Sacc. illustrated as EB0122, and to a lesser extent Rosellinia mammiformis (Persoon ex Fries) Cesati & de Notaris were also quite common, especially on saturated decorticated frondose woods. Lopadostoma turgidum (Pers.) Trav., illustrated as EB0217, on yellow birch, Betula alleghaniensis, proved to be rare, as extensive searches wherever the host was encountered proved fruitless. Diatrypaceae (Diatrypales): Members of the Diatrypaceae are readily distinguished by immersed to erumpent stromatic tissues, usually in wood, at times delimited by a black marginal zone, bearing immersed ascoma, arranged in diatrypoid, valsoid, eutypoid or eutypelloid configurations. Perithecia beaked, often pronouncedly sulcate at the apex, ostiole periphysate, bearing clavate, often long stipitate octosporus or polysporous asci, apical ring shallow, +/- amyloid, narrow paraphyses numerous, ascospores yellowish to light brown in mass, oblong to typically allantoid, +/- strongly curved. Traditionally, the Diatrypaceae was included within the Xylariales, but recently it has received ordinal status due to the consistency of allantoid ascospores and coelomycetous anamorphs in an effort to make the Xylariales more homogenous. Members of this family were especially common fruiting on downed branches of many trees in the area. In the family Diatrypaceae, commonly encountered genera included Diatrype, Diatrypella, Eutypella & Eutypa, with Cryptosphaeria & Peroneutypa very rare. The beautiful iridescent green Diatrype virescens (Schwein.) M.A. Curtis, illustrated as EB0161, was especially common fruiting on downed branches of American beech, Fagus grandifolia, both in the spring and autumn. The common Diatrype stigma (Hoffman ex Fries) Fries (EB0215) was found fruiting on the downed branches of many broadleaf hosts, as was Diatrype disciformis (Hoffmann ex Fries) Fries on Fagus grandifolia. Eutypella cerviculata (Fr.:Fr.) Sacc. (EB0007) on river birch, Betula nigra, and Eutypella scoparia(Schwein.:Fr.) Ellis et Everh. (EB0008) on black walnut, Juglans nigra, were also very frequent, as was Eutypa spinosa (Pers.:Fr.) Tul. & C. Tul. (EB0165) on Carpinus caroliniana. Three Diatrypella with polysporus diatrypoid asci were also found: Diatrypella quercina (Persoon ex Fries) Cooke on Quercus alba (EB0220), Diatrypella frostii Peck on Quercus prinus (EB0075) and Diatrypella favacea (Fries) Saccardo on Betula nigra. Cryptosphaeria eunomia (Fries) Fuckel, on Fraxinus americana, and Peroneutypa heteracantha (Saccardo) Berlese, on Acer rubrum, were each only found once despite repeated searches on their respective hosts. Octosporous members of the Diatrypaceae were readily keyed out to species and host confirmations in NJ could be compared to those published in a recent monographic treatment for the family. Valsaceae (Diaporthales): Members of the Valsaceae are defined by the Diaporthe type centrum that contains deciduous asci readily loosening from the subhymenium and floating freely in the centrum. Like the Diatrypaceae, perithecia can be arranged in valsoid, eutypelloid or diatrypelloid configurations, but are usually associated with prosenchymatous or pseudoparenchymatous stromatic tissues, at times delimited by a black marginal zone, forming an erumpent ectostromatic disc. Perithecial beaks +/- emergent through disk, with a periphysate ostiole, beneath which are deciduous ellipsoid to oblong, non-stipitate asci, octosporus or polysporus, containing allantoid one-celled ascospores that are hyaline in mass. Perusal of downed branches invariably leads to members of the Valsaceae, often difficult to differentiate from the Diatrypaceae in the field. Most collected members of the genus Valsa were associated with the anamorphic Cytospora stage, identifiable after each rain by the extruded yellow cirrus. Valsa pini (Alb. et Schwein.) Fr., illustrated as EB0004, was especially common on downed coniferous branches belonging to Tsuga canadensis, Pinus strobus and planted Picea abies. Another common valsoid representative was Leucostoma niveum (Persoon ex Fries) von Hohnel, EB0113 on Betula species. Nitschkiaceae (Sordariales): Members of the Nitschkiaceae possess separate to gregarious ascoma, often with a sterile base, that are at first immersed, then widely erumpent becoming superficial on decorticated wood, finally becoming +/- collabent on drying. The apex is non-ostiolate, but possesses a unique region of hyaline dome-like cells in a gelatinous matrix, termed the Quellkörper, believed to facilitate rupture of the mature ascoma. The peridium is pseudoparenchymatous, often roughened with tubercles or short setae and possess unique Munk pores. The asci are basal or lateral and fasciculate, +/- stipitate, octosporus or polysporus, usually deliquescent and aparaphysate. The ascospores are allantoid to reniform, one to several septate, and usually hyaline, biseriate, sometimes in rows. This is a rarely collected group of ascomycetes. The most common member of the Nitschkiaceae in this study was Bertia moriformis (Tode ex Fries) de Notaris on weathered hardwood, illustrated as EB0191. It is easily identified in the field by the gregarious, stipitate, mulberry-like black ascoma without an ostiole, fruiting in vast swarms without a subiculum. Another member of the Nitschkiaceae, rarely mentioned in the literature, found on several occasions in New Jersey, was Nitschkia broomeiana (Berk.) Nannf. fruiting on dead, but still attached branches of Lonicera caprifolium, illustrated as EB0159. Some taxonomic confusion surrounds this fungus, as it is also known as Fracchiaea heterogena Sacc.. It is an interesting member of the family because of its polysporus ascus containing upwards of 200 minute, allantoid ascospores, many arranged evenly in rows. The ascoma is non-ostiolate in the traditional sense and has a prominent Quellkörper and is also heavily setose with barbed hairs, making for a very attractive and unusual fungus. Calosphaeriaceae (Calosphaeriales): This is an isolated order of ascomycetes, members of which are characterized by possessing asci in small fascicles or in spicate clusters lining the centrum, often with crosiers present, apical ring shallow, nonamyloid, with few paraphyses, these often apically tapered to acuminate, surpassing the asci in length, ascospores hyaline to lightly pigmented, varying in shape from allantoid to +/- oblong to ellipsoid, developing one to few septa, +/- budding in the ascus. It has recently been suggested that the Calosphaeriales represent a repository for morphologically similar fungi derived from the Diatrypales and the Diaporthales, and as such is polyphyletic. The only member of the Calosphaeriaceae found in this survey, was Calosphaeria pulchelloidea (Cooke & Ellis) Ellis et Everh., found fruiting underneath the peeled bark of sawn logs of Prunus serotina in Harriman State Park, Orange Co., NY. Numerous attempts were made to locate this fungus on P. serotinain New Jersey to no avail. It is included in the present report because, while it lies outside of the scope of this project, it merits mention and illustration (EB0164). Amphisphaeriaceae (Amphisphaeriales): An interesting strobilicolous coelomycete was found fruiting on the cone scales of planted Picea abies in Watchung Reservation, Union Co., NJ, identified as Pestalotiopsis stevensonii (Peck) Nag Raj, an anamorphic member of the Amphisphaeriaceae, illustrated as EB0067. Microscopic observation of vertical sections of the excised acervuloid conidiomata revealed fusiform three-septate conidia bearing characteristic apical appendages. Members of the Amphisphaeriaceae have historically been included in the Xylariales or the Diatrypales, but have recently been separated based on morphological and molecular data into their own order. Its members are united in having amyloid ascal rings and holoblastic denticulate acervuloid anamorphs. The Loculoascomycetes: Encountered bitunicate Loculoascomycete families in New Jersey included: Pleosporales [Botryosphaeriaceae, Hysteriaceae, Venturiaceae and Lophiostomataceae], Dothideales [Dothideaceae and Leptopeltidaceae], Patellariales [Patellariaceae], & Melanommatales [Melanommataceae and Platystomaceae]. Hysteriaceae (Hysteriales): By far the most common fungi in New Jersey belonging to the bintunicate Loculoascomycetes were members of the family Hysteriaceae. Members of the Hysteriaceae possess a unique ascoma termed hysterothecia, characterized by a carbonaceous boat-shaped peridium, opening by a slit and so coming to eventually resemble a bivalve mollusk. They are commonly encountered on well-weathered wood such as old stumps, bleached decorticated branches, fence posts and building planks. Encountered members of the family in New Jersey include Hysterographium mori (Schweinitz) Rehm. (illustrated as EB0099), Hysterographium fraxini(Pers.) de Notaris (EB0098), Gloniopsis praelonga (Schweinitz) Zogg (EB0154), Gloniopsis curvata (Fries) Sacc. (EB0157), Glonium lineare (Fries) de Notaris (EB0068), Hysterium angustatum Alb. et Schwein. (EB0002), and the very rare Glyphium elatum (Grev.) Zogg. An interesting biological association noted in this study was the continual co-occurrence of two species of dematiaceous sporodochial fungi, namely Berkleasmium conglobatum (Cooke & Ellis) Moore and Berkleasmium opacum (Sacc.) Moore (illustrated as EB0205 & EB0206, respectively), with ascoma of Hysterographium mori (Schweinitz) Rehm. Although no known telomorphic connection has yet been established for the genus Berkleasmium (?) the anamorph-telomorph connection between B. conglobatum and H. mori was suggested by R.T. Moore who stated that both fungi were present on the type specimen of B. conglobatum (Cooke & Ellis) Moore. However, M.L. Lohman demonstrated in 1933, through astute pioneering cultural studies, the anamorph of H. mori to be clearly coelomycetous with phialidic conidiogenesis and belonged in the genus Hysteropycnis, concluding that all anamorphs for Hysterographium were phialidic. The genus Berkleasmium however, is clearly sporodochial and aleurosporic. Nevertheless, examples do exist in the Hysteriaceae where associated anamorphs possess differing modes of conidiogenesis. The best example is the genus Glonium where both coelomycetous phialidic anamorphs and sporodochial aleurosporic anamorphs have been reported: M.L. Lohman demonstrated a Sporidesmium anamorph for G. clavisporum Seaver (= G. lineare [Fries] de Notaris) clearly reminiscent of a Berkleasmium. Cultural and DNA sequence studies would resolve these issues. Patellariaceae (Patellariales): Another group of bitunicate ascomycetes collected were members of the family Patellariaceae rarely mentioned in the literature, but quite commonly observed in New Jersey forests on well-weathered bleached wood, substrates similar to those supporting members of the Hysteriaceae. These fungi comprise their own order because of the unusual ascoma. The ascoma resembles that of the Discomycetes, namely a shallow, cup-shaped apothecium, only dark-brown to black in color and bearing bitunicate rather than unitunicate asci. The hamathecium at maturity is comprised of paraphysoids with free tips, these enlarged or branched, usually encrusted with pigment and forming a pseudoepithecium above the asci with a hymenial gel matrix (i.e., hymenialgallerte) often bluing in iodine. Three members of the family were collected: Patellaria atrata Fr. [= Lecanidion atratum (Hedw. Ex Fr.) Endl.] was found quite frequently and is illustrated as EB0152. More rare were the two patellariaceous fungi Rhizodiscina lignyota (Fr.) Hafellner [= Karschia lignyota (Fries) Saccardo] (EB0163) and Poetzia andicola (Speg.) Hafellner [= Karschi andicola Speg.] (EB0223). Both species were last collected in New Jersey by Job Bicknell Ellis in the 19th century: R. lignyota, the more common of the two, was collected by Ellis in Newfield NJ and P. andicola in Vineland NJ in 1878, as reported by Hafellner. Miscellaneous fungi: Some other interesting pyrenomycetes were collected in this study. On the under-surface of fallen leaves of the chestnut oak, Quercus montana (= Q. prinus), along the Copper Mines Trail, Warren Co., NJ, in the late fall are perfectly circular lesions, peripherally demarcated by minute black, undeveloped spheroid ascoma. As spring approaches these lesions support mature superficial pedicillate ascoma characterized by conspicuous rigid setae. The fungus is Acantharia echinata(Ellis et Ev.) Theiss. et Syd., illustrated in this report as EB0132, a member of the bitunicate family Venturiaceae (Pleosporales), with slightly apiosporic green ascospores. Like other members of the family, most notably the economically important apple scab fungus, Venturia inaequalis, these fungi have an over-wintering requirement for the development of the sexual state: in the spring, released ascospores are free to infect young emergent leaves. This is the first report, as far as I know, of the chestnut oak serving as a host for A. echinata. Another interesting, rarely collected bitunicate fungus is Pycnothyrium perexiguum (Speg.) v. Arx, belonging to the Leptopeltidaceae (Dothideales), illustrated as EB0158. This specimen was found fruiting profusely on the stems of an over-wintered escaped climbing rose in the Great Swamp National Wildlife Refuge, Morris Co., NJ. This is an unusual family of bitunicates, characterized by the formation of stromatic crusts comprising the ascoma, closely appressed to the cuticle and opening by irregular rupture. Finally, a remarkable coelomycete with appendaged conidia deserve mention. Pseudolachnea hispidula(Schrad. ex Fr.) Sutton found fruiting on an unidentified frondose weathered wood chip along the Howell Trail, Stokes State Forest, Sussex Co., NJ. This coelomycete, illustrated as EB0204, has a characteristic incurved excipulum with large, stiff dark setae, which, when moistened, opens widely to a shallow cupulate conidiomata to expose and release cylindrical conidiospores. Methodology: Fungi were collected from freshly downed tree limbs, bark, posts, fences, standing stumps as well as from weathered or decorticated wood on the forest floor. Living plant material was not collected, as fungi typically fruit on dead or moribund plant tissues such as downed branches, over-wintered leaf material, fruits and flower bracts. Material was trimmed with pruning shears in the field to segments less than 10cm long to fit into 4×5 inch manila envelopes. Pertinent field data was entered at the time of collection on the envelopes and included specimen identification number, date, longitude and latitude data, details of the collection site (i.e., dominant forest species), and taxonomic identification of the substrate as far as possible. An effort was made to collect enough material to allow for a positive identification, while leaving sufficient material in the field to effectuate survival of the individual colony. Collections of single ascoma were avoided. In the laboratory, collected fungi were examined under a Zeiss Stemi 2000 stereomicroscope, video photographed in situ and then excised from the substrate while still fresh for microscopic examination. Typically, vertical hand sections were made through the ascoma with a fresh double-edged razor blade and the resulting sections transferred to microscope slides for squash mounts. The mountant consisted of a drop of water, usually followed by the introduction of a drop of Metzler’s reagent (1.5g potassium iodide, 0.5g iodine, 20mL distilled water, 20mL chloral hydrate) to determine the amyloidity of the ascus tip and associated hymenial / paraphysoidal layers (e.g., hymenialgallerte in the Patellariaceae). Taxonomic details were documented by freehand line drawings under a Zeiss Universal Research Microscope, equipped for brightfield and phase contrast. Permanent microscope slides to accompany each voucher specimen were made using an inverted cover-slip sandwich technique. Briefly, material was mounted on a 22mm sq. coverslip held to the slide by a drop of water and a 18mm sq. coverslip placed on top. Following microscopic analysis and documentation in water, a drop of glycerol was introduced as the permanent mountant, and the coverslip sandwich sealed with clear nailpolish, finally inverted onto the same microscope slide containing a drop of Permount toluene solution (Fisher SP15-100). An effort was made to identify as many specimens as possible prior to the preparation of this report. A total of 228 ascomycetes were collected in the first phase of this project. Of these, 160 or 70% were identified at least to group, the remainder being sterile, effete, or not yet identified. Of the 160 identified specimens, 139 were identified to species (86%) and 44 are illustrated in the current report. Species listed as “unidentified coelomycete” comprise a group of specimens that will require more time to identify. 1) Britton N. and Brown A. 1913. An Illustrated Flora of the Northern United States and Canada (Vols. I-III). Reprinted 1979 by Dover Publications Inc., NY. 2) Little E.L., Bullaty S., Lomeo A., Rayfield S. and Buehl O. 1980. National Audubon Society Field Guide to North American Trees, Eastern Region. Alfred A. Knopf, NY. 3) Petrides G.A. and Wehr J. 1988. Peterson Field Guides Eastern Trees. Houghton and Mifflin Inc., NY. 1) Ainsworth G.C., Sparrow F.K. and Sussman A.S. (Eds.). 1973. The Fungi Vol. IVA, A Taxonomic Revision with Keys: Ascomycetes and Fungi Imperfecti, Academic Press, NY. 2) Barr M.E. 1990. Prodromus to Nonlichenized, Pyrenomycetous Members of Class Hymenoascomycetes. Mycotaxon 39: 43-184. 3) Barr M.E. 1987. Prodromus to Class Loculoascomycetes. Hamilton I. Newell Publishers Inc., Amherst, MA. 4) Barr M.E., Huhndorf S.M. and Rogerson C.T. 1996. The Pyrenomycetes Described by J.B. Ellis. Memoirs of the New York Botanical Garden Volume 79. 5) Clements F.E. and Shear C.L. 1954. The Genera of Fungi. Illustrated by Edith S. Clements. Hafner Publishing Co. NY. 6) Dennis R.W.G. 1981. British Ascomycetes by, J. Cramer-Vaduz Publishers. 7) Ellis J.B. and Everhart B.M. 1892. The North American Pyrenomycetes, A Contribution to Mycologic Botany, illustrated by F.W. Anderson. Published by the authors, Newfield, NJ. 8) Ellis M.B. 1971. Dematiaceous Hyphomycetes. CAB Publishers, Kew, Surrey, England. 9) Ellis M.B. and J.P. Ellis. 1997. Microfungi on Land Plants, An Identification Handbook. The Richmond Publishing Co. Ltd, Slough, England. 10) Eriksson O.E. 1992. The Non-lichenized Pyrenomycetes of Sweden SBT-förlaget, Lund, Sweden. 11) Hafellner J. 1979. Karschia Revision einer Sammelgattung an der Grenze von lichenisierten und nichtlichenisierten Ascomyceten J. Cramer-Vaduz. 12) Kiffer E. and Morelet M. 2000. The Deuteromycetes, Mitosporic Fungi, Classification and Generic Keys Science Publishers Inc., New Hampshire. 13) Muller E. and von Arx J.A. 1962. Die Gattungen der didymosporen Pyrenomyceten, Band 11, Heft 2, Beitrage zur Kryptogamenflora der Schweiz Kommissionsverlag Buchdruckerei Buchler-Co. AG, Wabern-Bern. 14) Nag Raj T.R. 1993. Coelomycetous Anamorphs with Appendage-bearing Conidia. Mycologue Publications, Waterloo, Ontario, Canada. 15) Rappaz F. 1987. Taxonomie et Nomenclature des Diatrypacees a Asques Octospores. Mycologia Helvetica 2 (3): 285-648. 16) Sutton B.C. 1980. The Coelomycetes, Fungi Imperfecti with Pycnidia, Acervuli and Stromata. CAB International Publishing, Wallingford, England. 17) von Arx J.A. and Muller E. 1975. A Re-evaluation of the Bitunicate Ascomycetes with Keys to Families and Genera by Studies in Mycology No. 9 Centraalbureau voor Schimmelcultures Baarn, Institute of the Royal Netherlands Academy of Sciences and Letters. 18) von Arx J.A. and Muller E. 1954. Die Gattungen der amerosporen Pyrenomyceten, Band 11, Heft 1, Beitrage zur Kryptogamenflora der Schweiz Kommissionsverlag Buchdruckerei Buchler-Co. AG, Wabern-Bern. 19) Wehmeyer L.E. 1975. The Pyrenomycetous Fungi. Mycologia Memoir No. 6, J. Cramer Publisher, Lehre, Germany. 20) Zogg H. 1962. Die Hysteriaceae s.str. und Lophiaceae, unter besonderer Berucksichtigung der mitteleuropaischen Formern Kommissionsverlag Buchdruckerei Buchler-Co. AG, Wabern-Bern.